The website from Apple isn't less: The layout is simple yet beautiful. Yet, one of the most awesome things about the website is the search functionality. It gives you suggestions (with images) about the several products they offer, making it really user-friendly. Today, we're trying to recreate the effect from that website by creating a fancy apple.com-style search suggestion. Make sure you check out the demo (or visit Apple.com) to see this awesome effect work. As you can see, the demo is located on another server. The reason for this is, that every time a user presses on his keyboard, a call is made to the MySQL database. When loads of users do loads of calls (at the same time), this could result in slowing down the database. The answer for this would that the results should be cached - Something that isn't implemented right now. Safari, Chrome and Opera are currently the only webbrowsers that support the drop shadow effect around the the search results. Other browsers will simply display the results without the drop shadow. This technique would be great if it were converted to a plugin for a CMS (WordPress/Joomla/Drupal etc. ), but also just very cool to have on your website. Check out this small video I placed on YouTube, showing this effect in full glory. Want to learn how I created it? Check it out. I assume the names of the columns are pretty straight forward. You'll need to fill in the data yourself (in the download, you can find all the INSERTS that can be found in the demo). Also, take note of the AUTO_INCREMENT from both id's. Now that we have the data stored, we'll need a front-end to place the data in. On to the next part! The HTML from the page isn't the spectecular: It simply holds one form element with an input box. Take note that no action is defined to the form. If you actually want to pass the data to the search page, you should add it. Also, no input-submit was added. More interesting in the code above, is the (empty) divider with an id suggestions. We'll fill up this divider later on with jQuery to place the actual found search results in. Even more interesting is the searchresults that we're going to display. Here's the HTML, I'll explain it below. #searchresults - Main container to place the search results in. .category - When a new category is displayed, simply use this span to differ it from the actual links. .seperator - This is used at the bottom of the suggestion, linking to another page (in this case: the sitemap). As you can expect, all values between the  and written in capitals needs to be data from the database. On to some CSS styling and make it look a lot more pretty! First, we'll fancy-up the page (looks pretty boring now, right?). I used the same background as in the polaroid viewer (hey, it looks pretty nice) and wrote the following CSS. 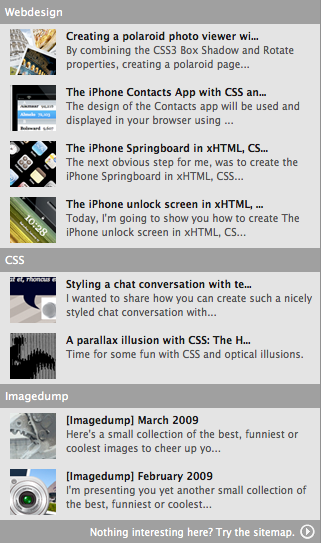 The search results use a little bit more complex CSS. This is what I came up with. Nothing really fancy going on over here actually. Only the #searchresults a is displayed as an block element, making the click-area have a full width and height. The search results page (when filled with data) should now look like this. Awesome, looks pretty good already! Now for the fun stuff: The PHP. You'll need to understand that the actual page is a static HTML file. The search results is a dynamic page generated by PHP based on the data retrieved. This is the final PHP file that retrieves the data from the database and generates the needed HTML. I've added some comments to make the code more clear. // PHP5 Implementation - uses MySQLi. // Show error if we cannot connect. // Is there a posted query string? // Is the string length greater than 0? // While there are results loop through them - fetching an Object. isset($_POST['queryString']) - When the PHP file received a POST request with a value queryString, it'll work (otherwise, it doesn't). We'll do the POST request with jQuery. mysqli - This script makes use of the PHP5 implementation of MySQLi. It created an object from the database (really handy). 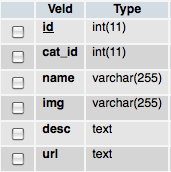 You'll need to change the values in the PHP file to make it connect to your database. $db->query - This is the place where the query is executed. As you can see, I join on the categories table to retrieve the correct category name. You can also see, that the $queryString only looks (and searches) by the name. You could enhance this query to also look in the description etc. strlen($name) > 35 - At this point, the script checks if the name is larger than 35 characters. If it is, it trims it down to 35 characters + "..." to make it fit. Now, we'll need to actually define the lookup function within jQuery. Once again, I've added comments to make the code clear. As you can see, when the inputString is empty, the suggestions box is being fadeOut. If not, it does an AJAX call to the PHP file (rpc.php) giving the inputString ad queryString. That's about it! jQuery makes this AJAX stuff prety simple. Although this tutorial may seem pretty hard, it actually isn't. It does really improve the search of your website and when this comes available as plugin for something, it would be really great. It's pretty fun to see too! Hope this was useful for you and that you can use this somewhere in your next project. Please share your thoughts! Ryan McDonough took the time and effort (thanks!) to create and share a PHP4 version of this script. You can download this version (that doesn't make use of mysqli) from the download section. When using the PHP4 script, open the SystemComponent.php file and change the variables to connect with the database. Daniel Kowalski from IT Systempartner took the time and effort (thanks!) to convert this script into a WordPress plugin called Searchlight. Feel free to visit his site and try it out.